Burnley Ladies made the short trip along the M65 to face Blackburn Community and had to share the points following a 1-1 draw. In the penultimate match of the season, with the teams placed fourth and third respectively in the North West Women’s Regional Premier League, a close game was inevitable. Despite an injury to Sarah Greenhalgh within the first couple of minutes, the lady Clarets started brightly, with Em Forrest and Justine Wallace dominating midfield. A long throw from Emily Wilkinson was lashed wide of the far post by leading scorer, Becky Hayton, a deflected strike from Forrest drew a save from the keeper, and a rising drive from Natalie Bell flew narrowly over. As the half progressed, Blackburn gained the initiative, and Burnley keeper Taylor Gregson saved smartly from a close-range header. 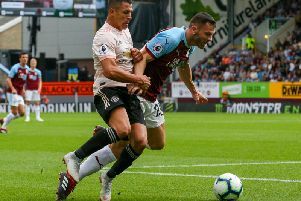 In the second half, Wilkinson’s shot arrowed past the post, before Burnley gained the lead on the hour when Bell gained possession and crossed for Hayton to head home from six yards. Blackburn equalised in the 70th minute when the defence hesitated in response to an off-side flag, but the referee overruled the lineman’s decision. Blackburn pressed for a winner, but were thwarted by the excellent Jo Holt, and the Clarets almost won it when a left-foot chip from Wilkinson struck the top of the bar. With one game remaining, Burnley are guaranteed a top-four finish.